Here is amazing Dmitry Bibikow who decided to make his own way after getting low answer from the council. 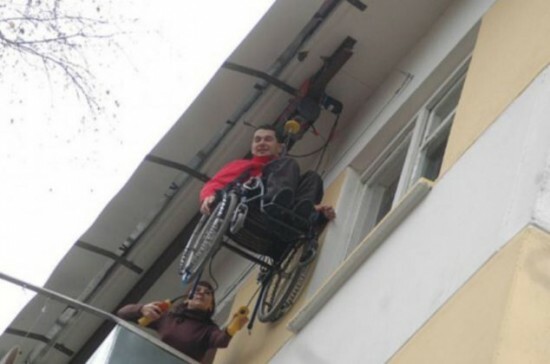 He took matters into his own hands and built his own elevator.The result is truly uplifting. Now when he wants to get into or out of his fifth floor flat the 32-year-old from Voronezh heads outside. Mr Bibikow, from Voronezh, south-western Russia, was badly injured after falling from a balcony but his determined spirit still drives him on. Built with help from friends the project cost him just £450.Now Dmitry is waiting for land to become free so he can build a house.